Aaron Sonson recently won a Human Rights Award, why? Because he is one of the Co – Founders of the Stop & Search Mobile App, created to bring fairness and transparency to the Stop & Search procedure. 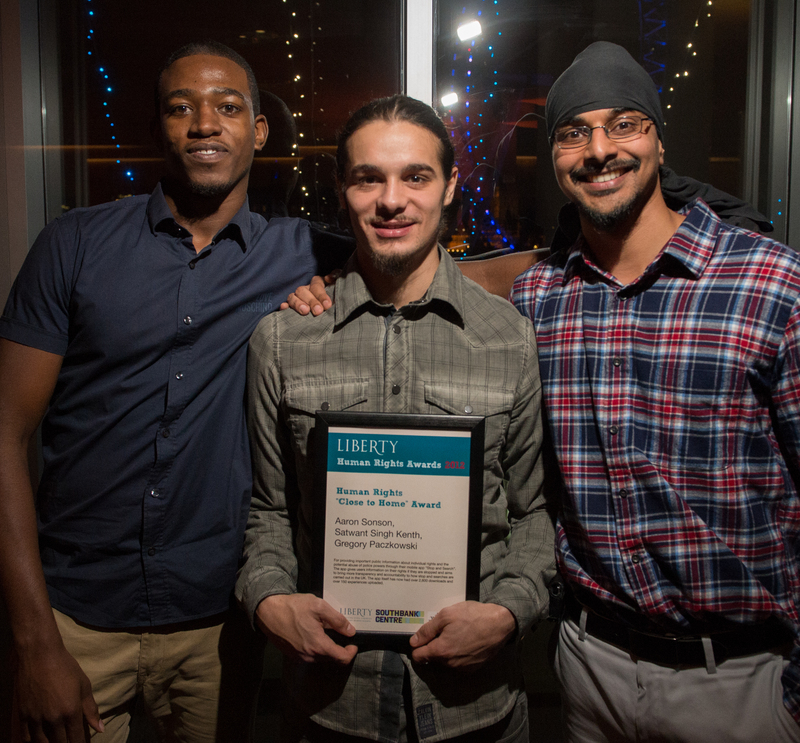 Human Rights “Close to Home” Award Aaron Sonson, Satwant Singh Kenth, Gregory Paczkowski – For providing important public information about individual rights and the potential abuse of police powers through their mobile app “Stop and Search”. The app itself has now had over 2,600 downloads and over 150 experiences uploaded. The app empowers the user with the knowledge of what their rights are in a Stop & Search situation. We put together the top ten things the public wanted to know about their Stop & Search rights, such as, “Do I have to get out of the car if the Police pull me over while driving”? And “Am I allowed to film the Police when I’m being Stopped & Searched”? We are 100% independent of the Police; however, we had to make sure the content was spot on so asked the Stop & Search Team in the Met to verify that this was the case. Among other things, we hope this section of the app will bring clarity to the procedure, by enabling the user to know when the procedure is being carried out in the right way and when it isn’t. The “Upload Your Experience” section of the app was created to allow people subjected to Stop & Search to give a review of their experience. Now obviously being Stopped & Searched is never going to be a walk on a sunny beach but it can and should be carried out with the upmost respect for the person who is stopped. Officers who abuse their power to Stop & Search are empowered in doing so by the lack of complaints or feedback given about their conduct, leaving them to carry on doing so knowing there is little chance they will be reprimanded for it. The app allows you to upload how you were treated and where the encounter occurred, along with the ID number of the officer who stopped you. This will help to build a picture of how Stop and Search is being used, while dramatically improving the accountability level of the officers conducting the procedure. If an officers badge number comes up with negative experiences we can highlight this with the relevant Police force to seek answers for why this is happening, this is just one example of how the feedback will be used. We’re aiming to form partnerships with organisations who can scrutinize the data to find any trends or experiences that need to be addressed once the app in in use on a wide scale. “Daniel Kaluuya, 24, who appeared in TV teen drama Skins and movie Johnny English Reborn, have lodged a High Court claim for up to £50,000 in damages. He was taken off a bus in Camden Town, pinned to the ground by four officers — one placing a boot on his head — and strip-searched at Kentish Town police station. Papers submitted to the court allege Kaluuya “was singled out because of officers racially stereotyping him”. he was returning home to Camden on January 11, 2010 when he was taken off a No 29 bus soon after boarding at about 8.45pm. Officers told him he fitted the description of someone acting suspiciously in the area, the claim states. Mr Kaluuya asked whether he had been singled out because he was black. The papers claim a male and a female officer were “aggressive from the outset” and “intimidating”. The pair backed Kaluuya against a shop window before pinning him to the floor and restraining him, helped by up to five colleagues after they radioed for help. He had his hands and legs cuffed and his trousers pulled down. Kaluuya was kneed in the back, neck and head, kicked in the legs and stomach and had his head and shoulder stamped on, it is claimed. When he refused to reveal his name, more force was applied via the boot on his head. The public consultation into Stop & Search is basically another way of trying to do partly what the app was created for, enabling the public to give feedback around their experiences of Stop & Search. We have had meetings with reps from the Home Office who expressed their belief in what the app could potentially do. As part of our promotion, one thing we wanted to do was send a nationwide e – letter to all secondary schools in the country endorsed by the Home Secretary, with leaflets and posters attached that could be distributed to raise awareness of the app among the students around the country. They declined, saying they couldn’t promote individual products in schools; the Department Of Education gave the same response when we approached them. Although this was disappointing to hear, we were grateful that The Home Office put us forward to be a part of a feature that ran on the BBC Breakfast Show around Stop & Search which we really appreciated. More support from government bodies and other organisations in helping us to raise awareness of the app would be helpful and encouraging, but we will strive to reach the public with our message with whatever resources and support we have. The Stop Search app is now available to download free of charge on Android, Blackberry & iPhone. The text below was written at the request of The Evening Standard, they had planned to have letters from various activists in anti-racism, it hasn’t been published as yet. ‘Well done Daniel Kaluuya for standing up to what is a symptom of structural racism in the UK. It is an obvious case of racial profiling of a dark skinned black man. As a well-known actor the attention placed on the case may actually help him win; unlike the vast majority of cases against police officers let alone the whole Met. We are still waiting for justice for the deaths in custody of Smiley Culture, Sean Rigg and Joy Gardener, Last year Mauro Demetrio, 21, used his mobile phone to record a police man making racist comments to him in the back of a van soon after the riots. It got some attention because he was savvy enough & lucky enough to be able to record the exchange & finally we had evidence as generally nobody believes a black man when he says he’s been abused by the police.. This is the tip of the iceberg, hundreds of black men and boys are subjugated to this dehumanising treatment each year. It is one reason why I support the Stop and Search app, created by Aaron Sonson, The app empowers the user with the knowledge of what their rights are in a Stop & Search. You can “Upload Your Experience” which allows people subjected to Stop & Search to give a review of their experience. It is imperative that a scrutiny is placed on the police officers that work on the streets, they run their own dictatorships but they are ambassadors for the Met and public servant and should act as such. Great job, much needed. Can this be made available to Windows phones as well? These affordable phones are possessed by alot of young people who would find this information invaluable! Well done to Aaron Sonson. Good job. In the YouTube clip of the BBC Breakfast interview, he encourages everyone. even the BBC hosts, to download the app. That’s a laugh. As if two middle aged, middle class white people, would ever get stopped and searched by the Police! ← Black Consciousness: an intersection of theory and praxis.